Texas Bed and Breakfast Inns come in all shapes and sizes, and all kinds of locations. 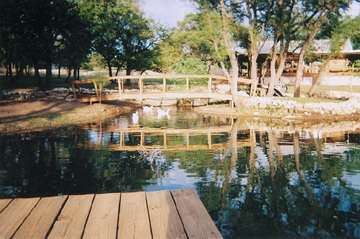 There are B & Bs in tourist towns, B & Bs in large cities, B & Bs in rural areas and at Texas lakes. Take a look at the Texas B & Bs below. You are in for a treat! Click on their links in their names below to go to their B&B web pages. A very romantic Getaway, located on 26 tree covered, rolling acres with several ponds and two creeks only 3 minutes from the shopping on Main Street in Fredericksburg. Choose from The Log Cabin, Hilltop Chalet, The	Mansion, The Mesquite Farmhouse or enjoy the SPA on the property. Granbury's newest Bed and Breakfast is very different from the ordinary but offers the same luxury you expect. We specialize in private, romantic, natural atmospheres perfect for a	honeymoon, anniversary or get-away. Nine lakeside acres of lush tree-covered hills and panoramic views. Featuring: beautifully and deliciously prepared organic and natural food, intimate, candle-lit dining, "Sleep Number" (TM) beds, spa and hiking trails, and the finest massages available...anywhere!